Setting of a story. It’s soooo important. Think of your favorite novel or movie…is there something in the location that adds to the story, or perhaps makes it impossible to happen anywhere else? (I bet there is.) What makes the setting of Romeo and Juliet so brilliant? The history of course! Let’s explore. The Play *Warning: SPOILERS* Once upon a time in an Italian city (presumably during the Renaissance era) there were two families: the Capulets and the Montagues…and they hated each other. And I mean HATED – if they met on the streets there was sure to be a fight. Juliet is a young lady of the Capulet family who isn’t too excited about the possibility of an arranged marriage. Romeo is a young man of the Montague family; he sneaks into the Capulet house during a party, sees Juliet, and falls in love. In the famous “balcony scene” the young people discover they’re in love. They marry secretly with the help of Friar Lawrence. 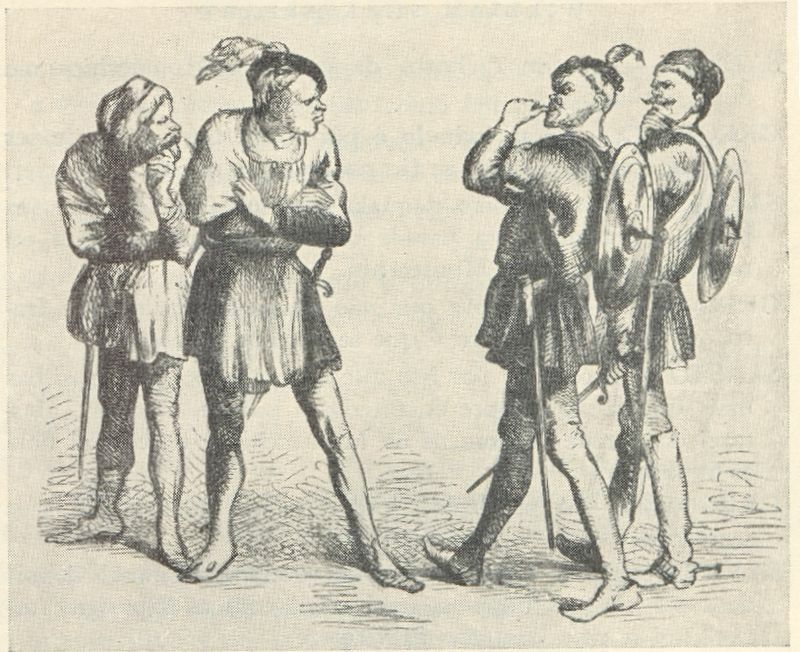 Then disaster: Romeo’s friend is killed and in an angry sword duel he kills a Capulet, Juliet’s cousin. Romeo is exiled from the city; Juliet is told by her parents that she will proceed with the arranged marriage. She takes a mysterious medicine which puts her in a deep sleep and makes her appear dead. Long story short, Romeo returns, kills another Capulet, finds his bride dead, and drinks real poison. 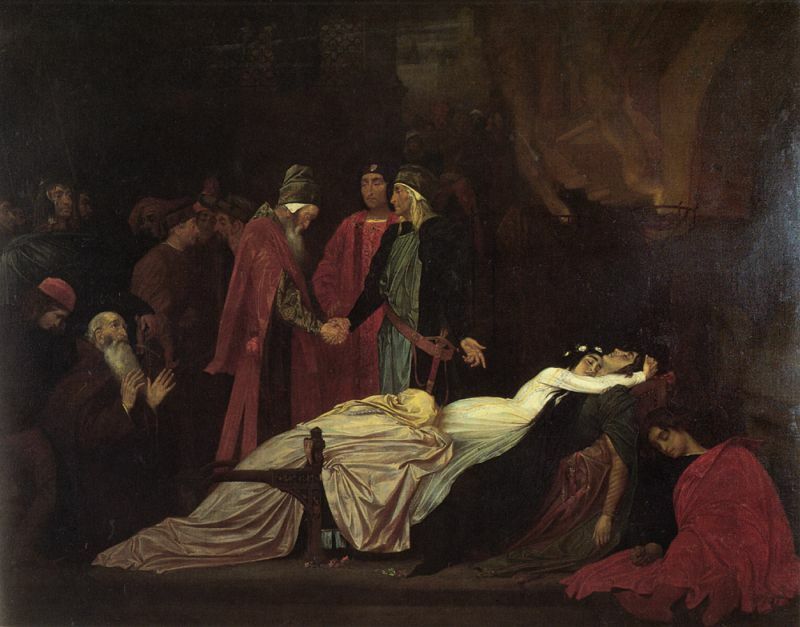 Juliet awakes, finds Romeo dead, and stabs herself with his dagger. In the end, the Capulet and Montague families agree to reconcile their quarrel and there is peace in the city. The History At least two authors before Shakespeare wrote a version of this romantic tragedy, but Shakespeare made the characters more realistic and the plot stronger. However, our historical focus on this play isn’t the characters or plot, but the setting. Italian cities of the Renaissance (1300ish to 1500ish) often had multiple noble families living within a walled city. Theses nobles’ “palaces” were more like castles, designed to keep others out. For various reasons each family wanted to control the city, usually for economic reasons: thus conflict! In Florence the Medici family feuded with other noble families, but eventually won the lengthy fight, exiling opponents from the city and gaining social, economic, and political control of the city. The Fiction It is probably that most of the play’s plot is fictional, but it is interwoven nicely with the historical setting. The fictional characters must over-come family prejudices to find love, but then those same family prejudices lead to more fighting and conflict. Analysis I’m going to be completely honest: Romeo and Juliet is not one of my favorite Shakespearean plays. However, I did find the historical setting fascinating. The quarrels between noble families of Italian Renaissance cities was real and makes a dramatic backdrop for the love story. There are multiple tragedies within the tragic play, but I think one of the best underlying conflicts is that hatred of the families which motivates the lovers and also tears them apart. In conclusion, the setting of Romeo and Juliet is a fairly accurate portrayal of the conflict-filled lives of noble Italian families during the Renaissance and adds tension to the foreground conflict of the young couple. P.S. Here’s a link to the full text of the play. Any thoughts on the setting or plot of Romeo and Juliet? P.S. 2. I’ve got my blog post done and, as of 0900 eastern time, Orion still hasn’t launched. 😉 See you tomorrow for the start of our Christmas holiday posts!